taken last night. Specifics of where and when exactly not known. The NWS Forecast Office did take a special sounding at 18 UTC today - above. The sounding shows a new BL developing with considerable low-level moisture and CAPE. But it appears that the new BL will also have considerable CIN (Convective INhibition). Note that at 2:00 pm the surface ob for TUS is 96/54 versus 104/54 at this time yesterday. So, it will probably take a considerable convergence zone to force storm development at low elevations locally. The PW has also been falling since the early morning max. 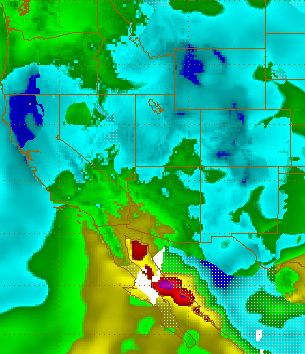 The 18 UTC analysis of blended PW from CIRA (below) shows a pocket of drier air sneaking into southeast Arizona. The GPS estimates of PW (above for Bisbee and below for TWC) have been showing the drops also. It appears that once again it will be a duel between the drier air and very moist air to the west. The added hitch for today is that substantial low-level convergence will have to develop to get storms in the low elevations of eastern Pima County. Plot below (from MesoWest for 1:00 pm MST) shows most light winds currently in play. A small MCS has been moving westward across the Borderlands this early morning - as per 1330 UTC IR satellite image above (another is also active in northwest Sonora). Composite radar below from TUS is for 1300 UTC. When I walked before sunrise skies were very dark to the south, but I saw no lightning flashes. When the sun rose there was a partial morning rainbow - no camera unfortunately. Regardless, this morning thunderstorm activity throws a monkey wrench into today's situation. 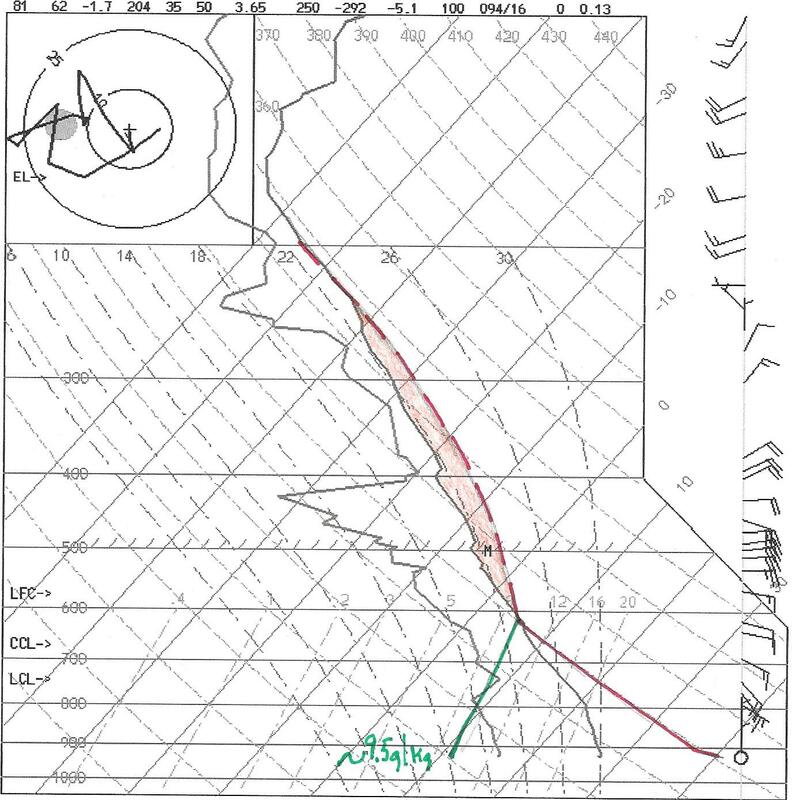 Yesterday the moisture hung in over eastern Pima County and by evening there was a surprisingly high amount of CAPE detected by the evening sounding - over 1500 m2/s2. This helped support several severe thunderstorms just to the south and west of the metro area. 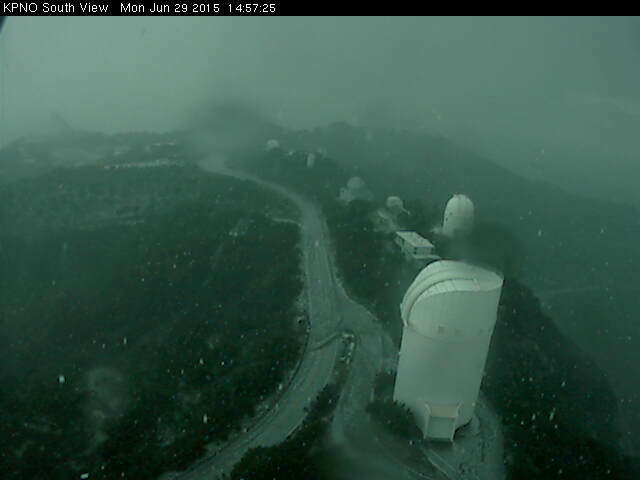 It was a very unusual situation since these storms produced large hail rather than the expected downbursts - see SPC report plot above and the Kitt Peak webcam shot of hail falling at the observatory. Given the unusual morning storms, I am showing two CG flash charts (from Atmo/Vaisala). The plot above shows widespread activity yesterday through 07 UTC. The back edge of the storms was again close to the western boundary of Cochise County, with more intense lightning storms indicated north to west to south of the metro area. There were several thunderstorms that impacted northern Maricopa County, and I see that Sky Harbor airport in Phoenix reported 0.05" of rainfall. The plot below shows CG flashes though 13 UTC this morning and is focused on the early morning MCS activity - the warm colors (orange to white) essentially show flashes that occurred after midnight. The two periods of storms makes for a complicated situation across the ALERT network. For the 24-hours ending at 7:00 am MST this morning, 53 of 92 sites had rainfall (nudging out yesterday for highest coverage so far this summer). 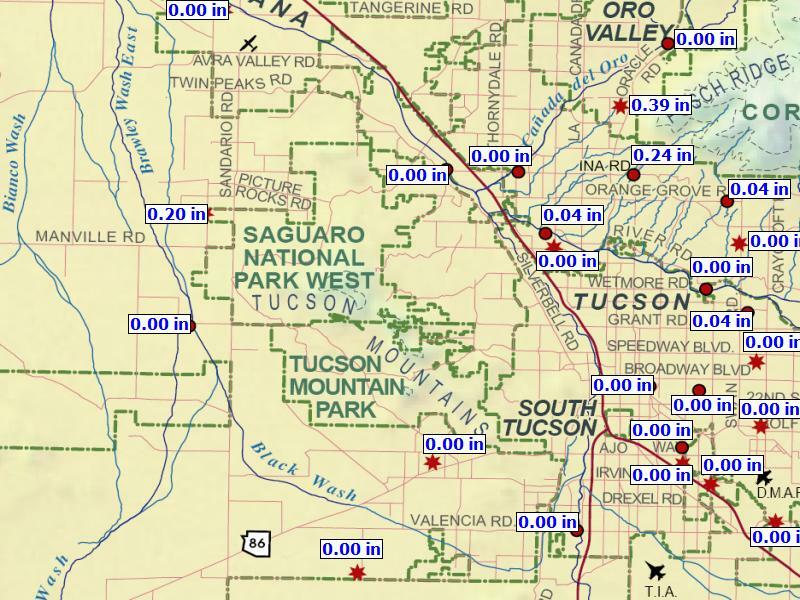 However, 17 of these sites had all or most of their rainfall during the past 6-hours as the morning MCS moved across southern portions of the network - for example, at Tubac 24-hour rainfall was 1.22" (most in network) but with 0.94" of that during past 6-hours. Here at the house we had thunder again and a shower before dark that produced 0.06". The last week of June has a chance to produce thunder here every day. But what happens today is a difficult forecast. The WRF runs at both 00 and 06 UTC did not forecast the morning MCSs at all and their forecasts can not be given much weight for this afternoon.. The morning TWC sounding reflects mostly the mesoscale environment of the MCS and is likely not representative of the larger-scale. I'll take a closer look at the morning observations to try to get a better feel for what the afternoon might bring. A special noon sounding from the NWS would certainly help clarify the complicated situation! 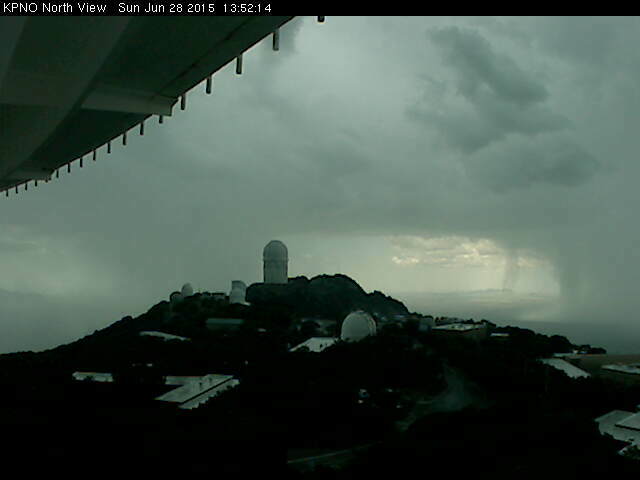 Edited to add: here's a rarity from Kitt Peak webcam at 2:58 pm - it appears that hail, apparently severe, was falling on the telescopes! Storms have been developing over higher terrain in all directions this early afternoon - above composite radar plot is for 2:35 pm. The storm near Oro Valley produced a CG flash close enough to here for a rumble of thunder at 2:30 pm. Out to the southwest, a heavy storm (below) was approaching Baboquivari Peak at about 2:00 pm MST. Looking south toward the Santa Rita Mountains at about 2:30 pm - above. Looking east toward the Rincons, photo below shows a little Cb that tried, apparently in vain. Yesterday was the most active storm day of the summer over eastern Pima County wrt to areal coverage of measurable rainfall. 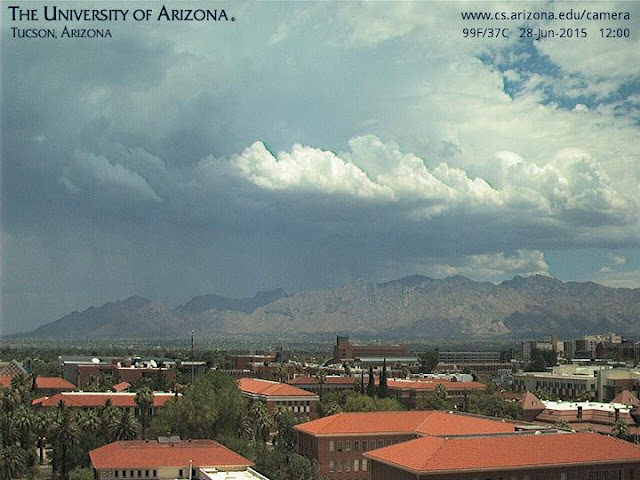 Webcam view from campus at about 3:45 pm MST shows a thunderstorm over the north part of the city. This storm was over the house at this time but was moving rapidly westward - net results: thunder, not much wind, and only 0.04" of rain. there have been thunderstorms here at the house for 5 consecutive days - quite something for June, but total rainfall those 5 days has been only 0.08". Across the ALERT network 48 sites had measurable rainfall (0.04" or more), making this the highest percent coverage of the summer so far. Amounts were again mostly light - only 8 stations had a quarter of an inch or more, and Cargodera Canyon (near Catalina State Park on west side of Mt. Lemmon) measured 0.94". The CG flashes detected through 10 pm last evening (below from Atmo and Vaisala) shows widespread thunderstorm activity across much of Arizona. Some storms did indeed make it all the way west to the Colorado River. Very noticeable though is the often-observed Phoenix doughnut hole and also little activity over Cochise County and southwest New Mexico. This morning's skewT plot of the TWC 12 UTC sounding is shown above. Even though there has been a bit of middle-level warming and a down-trend in PW, CAPE appears similar to yesterday. The wind profile though indicates that storm anvils would spread to the south-southwest today. Thus, storms over the Catalinas could spew anvil out over the city. Things are complicated today by the significant gradient of PW from central Pima County to southwest New Mexico, with lower moisture lurking to our east. Graphic below shows 12 UTC blended PW from CIRA, with high PW from here west but with an area with less than inch over southwest New Mexico. I have looked at the WRF forecasts from both the 00 and 06 UTC runs and can only say that the various forecasts for eastern Pima County are not consistent. 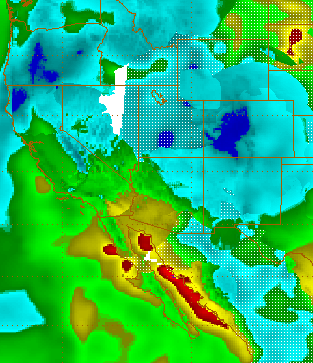 Shown above is the 06 UTC WRF-NAM forecast of rainfall through midnight tonight, while below is same forecast from the WRF-GFS. Basically, blending all the forecasts subjectively, it appears that we will be right in the battle zone of the moisture gradient. Initial storm developments could be anywhere from eastern edges of the ALERT network out to the western edges. As a half-empty rain-gauge meteorologist, I'd lean toward storms staying west today. But yesterday, it appeared that the 12 UTC WRF-NAM produced the best local forecasts, so we'll see what the new forecast runs show later this morning. What's A Typical Monsoon Day? The NWS Forecast Office has highlighted their weather story for today with the banner shown above. This leads me to ask: What exactly might a typical monsoon day be? During my 20+ years of watching the day-to-day summer weather out here, I have been continually impressed by the daily variability in how storms develop and evolve. Excluded of course, are extended periods of severe clear - breaks in the monsoon pattern. As for today, thunderstorms developed very early, with a storm just to our north, over the west end of the Catalina by noon, and others south of Green Valley. Today's storms have moved more rapidly off to the west and northwest. Radar above is from noon and that below is from just after 1:00 pm MST. Webcam views of Catalinas above at noon and below from Kitt Peak (looking north) at 1:53 pm. Pattern remains stagnant with nasty 500 mb anticyclone centered southwest of Salt Lake City with core heights of about 5960 m. Moisture has moved around the west side of the anticyclone and extends from west Mexico to the Canadian border. Really quite amazing for June. Forecast from latest NAM for 06 UTC tonight indicates little change, and weak vorticity maxima far removed from southeast Arizona. Little forcing for vertical motion, leaving storm initiations relying upon local circulations related to complex terrain. Mike Leuthold has already done a discussion based on the 06 UTC WRF forecast runs - those with access should refer to his analysis. Above is the TWC morning sounding, which I have modified for mid-afternoon conditions. Moisture in the well-mixed BL seems to have increased a bit, offsetting a bit of warming around 500 mb. The lifted BL parcel this morning has theta-W of ~23 C - a fair value for more strong storms today (24 C and higher brings us our strongest summer storms). The wind profile is supportive of organized storms and the WRF forecasts take storms today far west into the low desert. The warm inversion aloft, above 500 mb, seems to have vanished for today. The culprit today would be upper-tropospheric subsidence, renewing the warm air aloft. 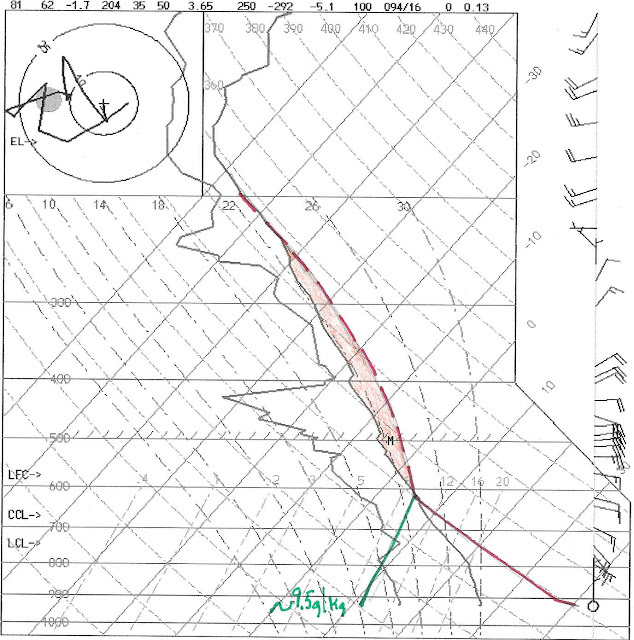 However, I have scanned the nearby soundings at 400 and 300 mb and don't find any indications of warm advection, nor do any of the upstream soundings indicate the warm inversion. Another day whose outcomes will be determined by where the strongest initial storms develop and how they propagate. Visible image below (from 1540 UTC) illustrates the remarkable moisture and cloud plumes over the west that I mentioned above. Phoenix area did experience its first haboob of the summer yesterday afternoon. Above photo from Gilbert suburb shows traffic moving along in the dust (by David Kadlubowski). There were quite a few severe reports in the Southwest yesterday, with most clustered near Phoenix (below shows reports from SPC). Given the low level of population in most areas of Southwest, I suspect that actual severe storms numbered at least an order of magnitude more than were reported. There were too many wind gusts over 40 mph in the NWS and RAWS networks yesterday to list. Observing sites that reported over 50 mph included PHX, Casa Grande, Tonto Basin RAWS and Guthrie RAWS. Here at house I estimated 50 mph from an abrupt thunderstorm downburst that caused several power surges. The plot of detected CG flashes through midnight last night (above, from Atmo and Vaisala) shows widespread thunderstorm activity- easily the most widespread event of the summer so far. The severe winds in Phoenix area were produced by outflows that ran far away from the active thunderstorms that produced them. 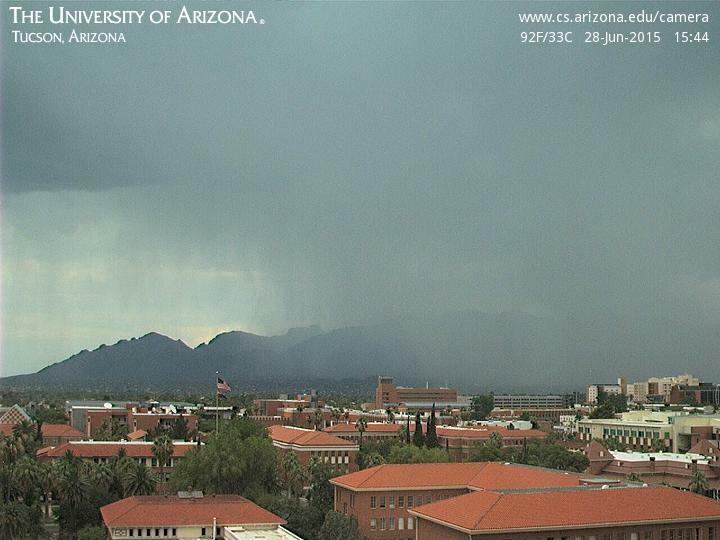 Storms across the Tucson metro area were somewhat isolated and didn't produce much in the way of rainfall. A small cell hit here at the house but left behind only 0.03" - airport had 0.05" and DM measured only a trace. Across the ALERT network 36 of 92 sites measured 0.04" or more, but most amounts were less than 2/10s of an inch. Only three ALERT sites had a quarter inch or more, with max amount being 0.51" on far east-northeast side of town. The metro west sector of the ALERT network shown below (24-hour rain ending at 6:00 am MST this morning) illustrates the very spotty character of rain on the ground yesterday. The Phoenix NWS office has temporarily relocated to the Tucson NWS office this weekend....due to some work being done at their office in Phoenix. That's probably why there was no sounding today....and if that's the reason, why there probably won't be a sounding tomorrow either. I think they're back in their office late Sunday night (10 pm). Conditions this afternoon are favorable for strong thunderstorm outflow winds across south central Arizona. A Blowing Dust Advisory is in effect from 3pm this afternoon until 8 pm this evening for Pima and South Central Pinal counties. 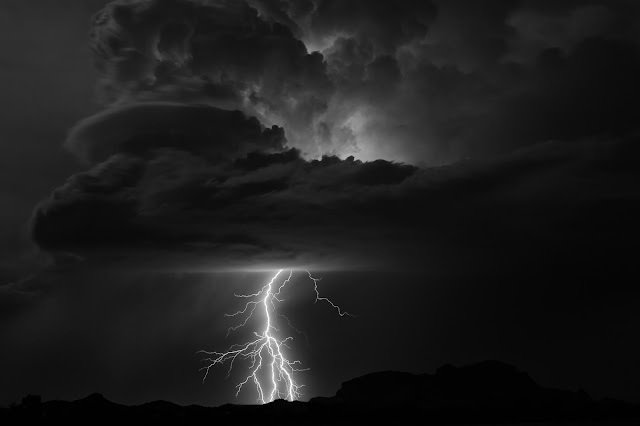 Thunderstorms frequently produce strong downward rushes of air, called downbursts. These gusty winds can generate areas of dense blowing dust that may limit visibility and cause health concerns. Individuals with heart disease and respiratory sensitivities may want to limit exertion and reduce exposure today. If driving and a dust storm approaches, remember: PULL ASIDE · STAY ALIVE! (Pull off the road, put vehicle in park, turn off lights, take your foot off of the brake). The SPC has also issued a slight risk area for severe thunderstorms for this afternoon - below. The area is similar to the dust advisory region but extends a bit further east. Both of these forecasts indicate a significant shift of thunderstorm activity toward the west and northwest, extending into the Phoenix metro area. Unfortunately, there was no upper-air sounding taken at PHX this morning. In fact, there are no soundings this morning from Guaymas, Yuma, Phoenix, nor Flagstaff, making diagnosis quite difficult. The 12 UTC sounding for TWC is shown above. Things of note: the LFC/LCL continues to be around 600 mb with a mean mixed layer moisture of 8 g/kg - again an excellent situation for strong winds; steering winds appear stronger than any time this week, as 500 mb anticyclone remains very strong over the Great Basin; warm air above 500 mb continues to restrict the amount of CAPE. Preciitable water has continued to slowly increase due to both a steady, but weak influx from the GoC and re-cycling due to downdrafts and outflows. 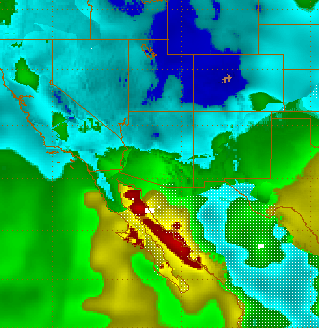 The blended PW analysis from CIRA (below at 12 UTC) now indicates highest PW over south-central Arizona. The 15 UTC visible image below at bottom indicates clouds thinning quickly over southeast Arizona, so reduced heating will apparently not be an issue today. The 06 UTC versions of the WRF model both forecast strong storms initially over the Tohono O'odham Nations to the southwest of Tucson, and then both models run storms from the Catalinas northwestward toward the Phoenix area - would cetrtainly have been nice to have a sounding from Phoenix on what could possibly be their first big haboob day of summer 2015. Here in the Tucson metro area the two variants of the WRF model have different outcomes this afternoon: the NAM version keeps thunderstorms off to west, northwest and north of Tucson, while the GFS version brings some storms westward across parts of the metro area. Another day to keep an eye on the sky. Yesterday did play out fairly similar to the previous day. Here at house it was another day with thunder, but not even a spit of rain and no strong outflow winds. However, both the airport and DM had thunder with rain (0.21" and 0.36" respectively). Frustrating since storms massed from the northeast to southeast of here, but then took on a southwesterly propagation component when they came off the mountains. Plot of CG flash density for 24-hours ending at 6:45 am this morning (above, from Weather.Graphics and Vaisala) shows that most thunderstorm activity stayed to the southeast corner of the state, with storms inching a bit further out into the metro area. The sequence of composite radar images below (from 5:13 pm MST to 6:18 pm to 6:39 pm) shows the storm activity on higher elevations to the east of Tucson; then the storms build into the southeast part of the metro area; and finally head southwestward across I-10 - a scenario we often see during the summer. As for rain amounts, there were some higher amounts over the mountains - Italian Trap on Redington Pass had 1.42" and Manning Camp in the Rincons had 1.61". Across the ALERT network 35 sites had 0.04" or more, but there were only three sites, including the two above, that had more than half an inch of rain. The only wind gusts I could find that reached 40 mph were 45 at the Mt. Hopkins RAWS and 42 at the Rucker RAWS. 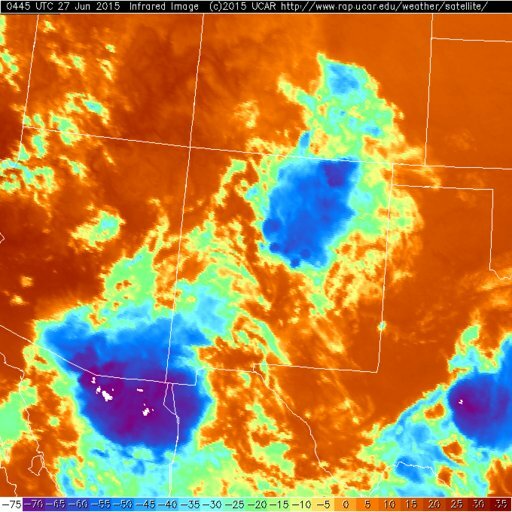 By 10:00 pm MST last evening, a large MCS was most active south of the border, with other areas of storms over New Mexico and Texas (IR image above is for 05 UTC from NCAR RAL). The storm activity yesterday has left behind a large area of debris cloud this morning, as shown by the 6:15 am visible image below. The widespread clouds may play a role in modulating how things evolve during the day today. Pueblo NWS - A Record Forecast Discussion?